If you’ve bought gemstone jewelry online, you’ve probably been surprised by the size of a gemstone at some point. For example you bought a ring with a 1 carat blue sapphire and were unpleasantly surprised when it arrived. It was far smaller than you thought it would be, smaller than for example than your engagement ring with a 1 carat diamond. Don’t worry, you were not ripped off. Just read the rest of this article to find out what caused your surprise. There are two reasons why gemstones with the same amount of carat are not the same size. The first reason is that the density will be different for each gemstone. For example, a sapphire has a density that is 14% higher than a diamond. This means that if you have a sapphire that is exactly the same size as a diamond, the sapphire will be 14% heavier. The carat of the sapphire will also be 14% higher, as carat is a measure of weight, not size. 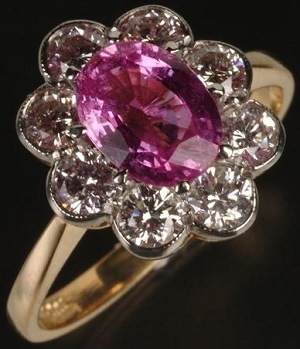 The second reason is that the cut can also have a large effect on the size of a gemstone. A diamond is cut to maximize its brilliance. The most popular cut is the round brilliant cut, which has a large crown and therefore a large diameter. On the other hand, most colored gemstones, like sapphires, rubies and tourmalines, are cut to bring out the best color possible. Different cuts are used to maximize the color and size of a rough colored gemstone. Most of these have a smaller crown than a diamond and will look smaller. Combine these two reasons and it will become obvious why a 1 carat diamond will look bigger than a 1 carat sapphire. When you compare a 6mm round diamond with a 6mm round sapphire, you will immediately see the difference. The former will weigh just over 0.8 carat, while the latter will usually weigh between 1.0 and 1.4 carat! So the best way to avoid this kind of surprise is to look at the measurements of a gemstone, instead of carat. Click here for more information on carat.